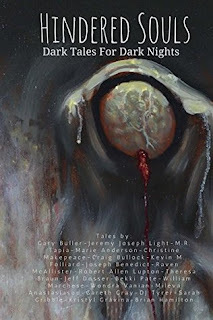 Hindered Souls: Dark Tales for Dark Nights is a really astounding debut collection from Hindered Soul's Press. This is a relatively new indie horror publishing company formed in 2016 and they have really started off with a bang. I have to admit I do love reading short horror fiction and had to buy this one even though I have so many queued up on my kindle. 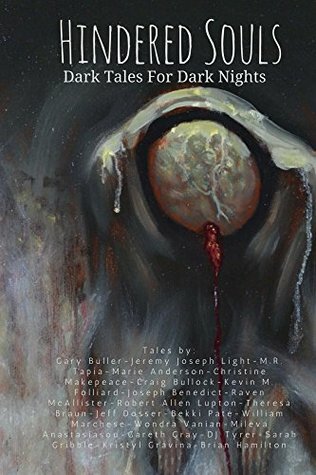 It features 25 brilliant dark tales and many of the authors featured in this are really starting to make a name for themselves. This had to go straight to the front of my kindle queue. What's great about this anthology is that there is a really wide range of horror styles, some are scary, some are weird whilst others are creepy and some have a really beautiful feel to them. There is something for everyone because we all have our own preferences. There were so many that I really enjoyed and whittling them down into my favourite pile was really very tough as the bar has been set really high. Highlights for me include Shelf Life by Gary Buller. A tale that every man can relate to. Every story that I've read of his is utterly brilliant and if you liked Shelf Life you will love his other recently published tale, Wicked Congregation featured in the Monsters Exist Anthology by Deadman's Tome.He also has released his own short story anthology, Mechanisms of Despair, and all proceeds go to two great charities; Sarcoma UK and The Alzheimer's Foundation. Magic Hour by Christine Makepeace was another favourite, it stood out to me through it's beautiful ethereal writing and is a really original tale. An author I'll definitely be keeping an eye out for. Baby Bird by Craig Bullock was also exceptionally creepy and scary, loved it! Sometimes when I read short horror tales I think wow that tale would make a brilliant film and Baby Bird was one of them. Degeneration X by M.R Tapia had a really cool sci-fi horror feel unlike anything I've ever read before. Tonight Forever by William Marchese was deliciously dark and features a very dark messenger indeed. While My Guitar Gently Weeps by Theresa Braun. is a tale set in the heart of swinging London of a down and out trying to get his life back and making quite the deal! Hindered Souls is out now and available on Kindle and in paperback. Buy it now! Every where discussion about the tales and it is horror. I want to recommend this assignment masters to read online tales for young and children. I also read in free time for make our mind fresh..
As much as I hate horror movies, horror books attract me a lot! I believe I could use some ideas for UKessays too!